Happy New Year! Welcoming the New Year involves reflecting on the past year and looking ahead to the year ahead. This usually means making a long list of resolutions for what we will do differently during the new year ahead. While made with the best intentions in mind, New Year’s resolutions are often lofty and ultimately unrealistic and by February many become history. Rather than making New Year’s resolutions, the focus on reflection can be a much more powerful way to propel a person forward into the New Year. Reflection can highlight past efforts, challenges, and accomplishments, which can be built upon rather than starting completely over. We would like to suggest using the classroom charts to begin these valuable reflective conversations with your students about what was challenging, what they have worked hard to learn and what new challenges they are ready for. Talking about what has been hard or challenging can develop what Carol Dweck calls a “growth mindset” and her research has shown that those with a “growth mindset” thrive on challenges and understand that even failure can be an opportunity for learning and growth (Mindset, 2006). People with a such a mindset are more flexible and less likely to give up or think less of themselves when something is difficult. The charts in your classroom tell the story of the teaching and learning that has happened since the start of the school year, so offer the perfect way in to having conversations about the children’s efforts to date, their attempts, and their successes and what they might be ready for next. The new year is not for completely new, fresh starts, but a continuation of development and growth which can ultimately lead to a more successful year. Start with deciding which subject(s) you want to focus on. 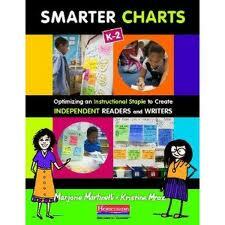 We suggest looking at the Reading and Writing charts together to reinforce the reciprocity between these two subjects. Math might stand alone or be teamed up with Science. Or Science might be looked at with another inquiry subject such as Social Studies. Once you have decided on the subject(s) you are ready to begin charting conversations. Then ask children to begin the inquiry by choosing a chart to read over, then they can ask themselves or each other, “What have I learned the most?” “What are some things I want to work more on?” or “What is still kind of hard?” As with any inquiry there are no right or wrong answers, just possible insights or further questions. Standing back, taking a pause, taking a moment to reflect and ponder, can be a good thing for teachers and students both. This is often a sure-fire way to infuse some fresh energy and commitment to the challenges that lie ahead. Wishing you all Happy Charting in 2015!